CreatureCantina.com: This IS the Droids Custom art you're looking for! This IS the Droids Custom art you're looking for! 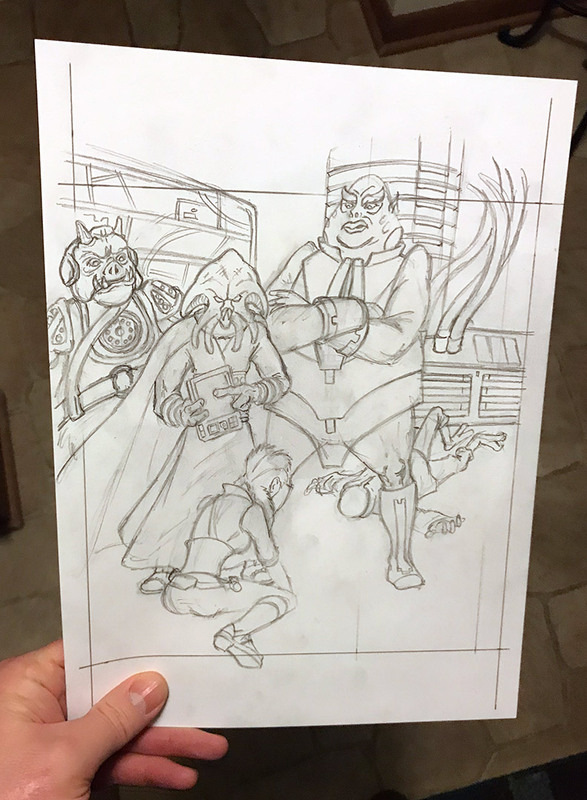 Last week I posted a story about the Squidhead Droids Custom artwork I decided I wasn't going to use. As I explained, I wasn't quite happy with how it was turning out, so I decided to scrap it and start anew. You can see this new artwork tells the same story as the first. For those who don't know his backstory, Squidhead was Jabba the Hutt's accountant. For this piece, I decided to envision what happens when the top gangster's bookkeeper comes calling when your balance is due. You know when the accountant comes calling, he's gonna come at you with some muscle in tow. Our unfortunate debtor in this scene is Kea Moll. I think this version of the art better conveys the menace and danger of the event. I mean, Squidhead here looks like a badass. And Kea's clearly in much greater distress. So I'm really happy I decided to redo the art. These pencils are nearly complete. I still need to clean up a few elements. I'm terrible at backgrounds, so for this card I stole one off a Kea Moll screen grab I found on Google. Sometimes the old tricks are the best tricks. Stay tuned for inks, coming soon! !